Clark Howard is a nationally recognized radio-show host and bestselling book author. He is generally regarded as a money-saving expert and his motto is “Save More, Spend Less and Avoid Getting Ripped Off.” Clark is also a father of three and combined his money savvy skills with his parenting experience to create Clark Smart Parents, Clark Smart Kids. This book was originally published in 2005 but his advice and thoughts are timeless for any parent who is concerned with teaching their child money management skills. Clark Smart Parents, Clark Smart Kids is divided into sections by age: kids, teens, adult children and your parents. There is also a section with worksheets, activities and resources. For the purposes of this blog, I am only going to share with you the highlights of the kids and teens sections. Allowances: Clark’s allowance plan promotes having a basic set of responsibilities and a basic allowance for each child. Kids can earn more money by doing extra chores. Clark recommends $1 per week for each grade level (a first grader would get $1 per week; a second grader would get $2, etc.). However, he suggests adjusting this figure as you determine appropriate. Chores: Clark suggests dividing chores into two categories: basic and extra. Basic chores are required responsibilities and must be accomplished for allowance to be awarded. He has a cool idea of a chore wheel that enables these basic chores to be rotated among the children. The extra chores (or jobs) are tasks that enable the child to earn extra money. Affluenza: Affluenza is the term Clark uses to describe the “lack of appreciation for what we have that is brought on by abundance.” One of the ways he suggests to counter affluenza is to use an allowance. Instead of buying your child the toy of the moment, tell him to save up his allowance to pay for it. This method encourages delayed gratification and develops an appreciation for what they have earned. Managing Money: Clark suggests the Save, Spend, Share method to teach kids and teens how to organize and plan for their money. Technology: Clark recognizes that teens love technology and encourages families to look for ways to use new technology to learn money management skills. 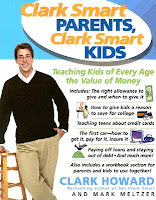 Clark Smart Parents, Clark Smart Kids is full of much more great advice --- from chores for young children to buying your first car. I highly recommend this book for any family who wants a comprehensive, basic plan for developing money management skills in their children. And for those teens who are looking for new technology to manage their money, give MoneyTrail a try!